Veterans with PTSD are at Higher Risk for Sleep Disorders | Advanced Sleep Medicine Services, Inc.
PTSD (Post Traumatic Stress Disorder) manifests itself in many ways. The symptoms of PTSD aren’t limited to distressing memories and emotional trauma. In fact, a large body of research has shown that veterans suffering from PTSD are at increased risk for a host of sleep disorders. The complex relationship between anxiety, breathing problems, hyperarousal, and intrusive memories makes it difficult to isolate the factors causing these sleep disorders and can complicate treatment. But a couple things are clear; veterans experience sleep disorders at a very high rate, and it is very important for these disorders be treated in addition to targeting the PTSD itself. PTSD is associated with a variety of sleep disorders, including sleep apnea, insomnia, and nightmares. Sleep apnea is estimated to affect about 5% of the population in the United States. However, its incidence in men with PTSD has been shown to be much higher. One study^1 of 136 vets with PTSD found that a staggering 77% of vets tested positive for sleep apnea. Another study^2 of 105 Vietnam-era vets found that 70% of the vets had this sleep disorder. Even in young veterans, the severity of PTSD is positively correlated to risk of obstructive sleep apnea (OSA) ^3. The outcomes of these studies, showing a strong correlation between PTSD and sleep apnea, have lead to some doctors recommending that all vets be screened for sleep apnea as part of their treatment. It’s not surprising that veterans suffering from psychological trauma have trouble sleeping. At least 70% and as much as 90% of vets with PTSD self-report sleeping disturbances^4. Nightmares top the list of sleep difficulties associated with PTSD. While nightmares occur frequently in only 3% of the general population, over half of vets with PTSD experience frequent nightmares^5. The nightmares consist of repeated experiences of combat-related trauma and intrusive memories. Periodic limb movements often accompany the nightmare as if the veteran is actually reliving the experience.Breathing may become labored and erratic. Sleep disorders can only compound the emotional and psychological issues associated with PTSD. Poor sleep on its own is linked to depression, higher stress levels, and an increase in negative emotions. Not being able to get a good night’s sleep and the ensuing emotional and physical strain is a significant stumbling block in the way of returning to mental health. Additionally, sleeping well during the night is vital for performing well during the day. Veterans who can’t sleep find it even more difficult to readjust to civilian life, hold down jobs and maintain relationships. Sleep disturbance puts them at higher risk to turn to self-medication through substance abuse, self-destructive behaviors or to develop mental disorders. Part of the solution to this problem is to recognize the extremely high prevalence of sleep disorders in vets and to screen for and treat such sleep-related issues as part of their routine treatment. Returning our troops to emotional health can’t happen until they are able to get the rest and restoration they need. If you or a loved one is a veteran with PTSD, or if you’re having trouble sleeping for any other reason, we can help diagnose and treat your sleep problems to put your mind and body at rest. Contact us or request a sleep study to get on the road to reclaiming your sleep. 1) Dodson, Darrel W. et al. “Sleep-Disordered Breathing in Combat Veterans With PTSD.” Chest Journal. 2) Jerome A. Yesavage, M.D. “Sleep-Disordered Breathing in Vietnam Veterans with Posttraumatic Stress Disorder.” The American Journal of Geriatric Psychiatry. 3) Peter J. Colvonen, PhD et al. “Obstructive Sleep Apnea and Posttraumatic Stress Disorder among OEF/OIF/OND Veterans.” Journal of Clinical Sleep Medicine. 4) Maher MJ et al. “Sleep disturbances in patients with post-traumatic stress disorder: epidemiology, impact and approaches to management.” PubMed. 5) Thomas C. Neylan, , M.D. et al. “Sleep Disturbances in the Vietnam Generation: Findings From a Nationally Representative Sample of Male Vietnam Veterans.” The American Journal of Psychiatry. 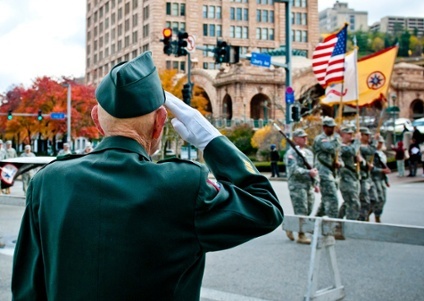 Photo Credit: “A Veteran’s Salute”. The U.S. Army. Creative Commons License. Does My Dad Have Sleep Apnea? How Does the Affordable Care Act Treat Sleep Apnea? How Much Will a Sleep Study Cost Me?